Artcurial had a spectacular 2015 Paris classic car auction with a 1961 Ferrari 250 GT California Spider selling at a new world record of $18.5 million. Seven cars achieved results in excess of a million dollars while at least ten model records were set at the auction. The 59 barn-find cars from the Baillon Collection sold for more than $28 million – in some cases exceeding pre-auction estimates twenty-fold. Artcurial’s classic car auctions during the annual Rétromobile week in Paris in early February is usually a great occasion to see a wide variety of interesting and rare European classic cars. However interest in the 2015 auction shot into orbit once it became known that Artcurial will put up a collection of 59 barn-finds – cars from the 1950s to 1970s that were part of the Baillon collection. All 59 cars found new buyers – frequently at double the pre-auction estimate and in a few cases 10 and even 20 times pre-auction estimates. Buyers were paying as if restoration costs will be no concern. This part of the auction alone grossed €25.15 million (28.5 million) including the top-selling Ferrari and a €2 million Maserati. The second part of the Artcurial sale saw 117 cars auctioned with a sell-through rate of 89% – fairly high for Paris. The total earnings were €46 million ($52 million). In all ten new auction model records were set, plus a new auction record for a car sold in Paris. Seven cars sold for over a million dollars with a further couple of unsuccessful highest bids very close to the reserve margins leaving the possibility of post-auction deals. Top billing at the 2015 Paris classic car auctions went to a 1961 Ferrari 250 GT SWB California Spider – a barn-find from the Baillon Collection. The pre-auction estimate was €9.5-12 million but the hammer finally came down at €14.2 million – €16.3 million ($18649,760 million) once charges were added. This set a new auction record for a Ferrari 250 GT SWM California Spider – the previous record was $15.2 million paid at the 2014 Pebble Beach Gooding auction. This is also the highest price paid for any car at public auction thus far in 2015. Artcurial’s second highest result at the 2015 Paris auction was €2 million for a 1956 Maserati A6C 2000 Gran Sport Berlinetta Frua. This car was found together with the record-breaking Ferrari California Spider in a barn on the Baillon farm. It sold for almost double its pre-sale estimate of €800,000 to €1,200,000 and set a new model record. This car is one of only four produced with coachwork by Frua. It has been in the possession of the Baillons since 1955 and is in a complete, unrestored condition. The third-highest result at the Artcurial 2015 Paris classic car auction was €1.9 million for a 1966 Ferrari 275 GTB Berlinetta “Long Nose”. Although not part of the Baillon collection, this Ferrari has also been in single-family ownership since 1972 and is in a maintained but unrestored condition. A second 1966 Ferrari 275 GTB Series 2 Long Nose attracted a highest bid of €2.6 million but failed to clear the reserve margin. 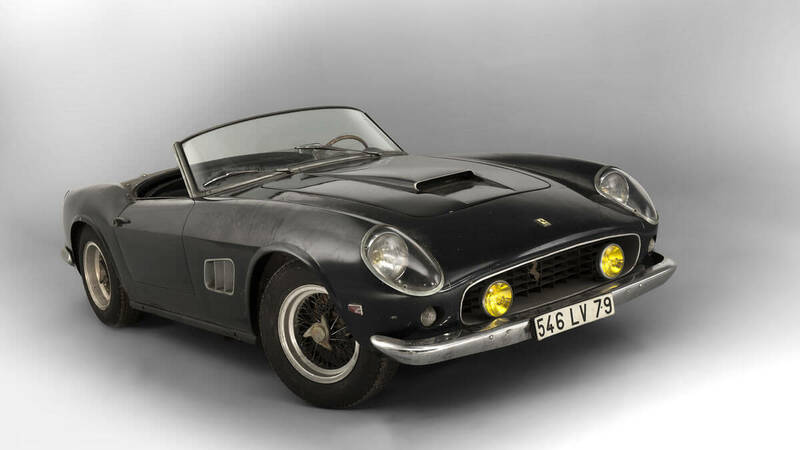 The estimate for this Ferrari that once belonged to Roger Vadim and Jane Fonda was €2.75 – €3.25 million. A third barn-find car from the Baillon collection achieved a result in excess of a million dollar at the Artcurial 2015 Paris auctions. A 1949 Talbot-Lago T26 Grand Sport SWB with coachwork by Saoutchik sold for €1.7 million. The top result for a German car at the Artcurial 2015 Paris auction was €1.4 million for a 1938 Mercedes Benz 380 K Cabriolet A. This car is one of four survivors of the 16 Mercedes Benz 380 K cabriolets ever built. It is in a high-class restored condition – it won Second Prize in Class (Mercedes Benz Pre-War) at the Pebble Beach Concours d’Elegance in 2005. Another surprise on the list of cars selling for more than a million dollars at the 2015 Artcurial Paris classic car sale was the 1968 Bizzarrini 5300 GT Strada. It sold for €1.2 million – nearly double the pre-auction estimate and a new model record. This very rare GT car was built by Giotto Bizzarrini, a former Ferrari engineer and had the same owner since 1970. The car has been in France since new – the name so rare that the French authorities managed to make three spelling mistakes in the car’s name on the original registration documents. The seventh car selling for more than a million dollars at the 2015 Artcurial Paris auctions was a 1957 Mercedes Benz 300 SL Roadster. It achieved €929,800 or $1,064,621. The car was last restored in 1983 by Mercedes Benz and came with a hard top. A 1955 Mercedes Benz 300 SL Gullwing attracted a highest bid of €1.1 million but failed to clear the reserve. Its pre-auction estimate was €1.2-1.3 million. Artcurial’s next classic auctions are in Paris in June and Monte Carlo in July.